Why just wipe when you can clean with water? Combining the best of a toilet and a bidet, plus many extra features, this sleek shower toilet will change your daily cleaning routine for ever. This technologically advanced toilet has two separate self-cleaning spray heads that you can adjust for position, pressure and temperature, with oscillating and massage spray options and a warm air dryer function. Make visiting the toilet a pleasure with features designed for comfort, including automatic seat and lid opening and a powerful flush that cleans and covers the whole bowl. Designed to be 100% hygienic and easy to clean, the toilet uses odour absorption to clean the air while advanced ceramic finishes HyperClean and AquaCeramics are anti-stick, anti-limescale and anti-bacterial, banishing 99.9% of germs. The air-disinfecting technology PlasmaCluster* actively eliminates bacteria inside the bowl. The sleek, wall-hung toilet design looks perfectly at home in contemporary bathrooms and its smooth lines leave dirt nowhere to hide. Use the control panel on the side of the seat, the remote control or a smartphone app to control and programme, and let the GROHE Sensia Arena revolutionise your daily bathroom routine. GROHE SkinClean technology offers a wide choice of cleaning sprays, including an adjustable rear spray, separate Lady Shower spray, an Oscillating Spray function for expanded cleaning and a Massage Spray for a soothing experience. The sprays can be adjusted for water temperature, pressure and position, and all spray heads can be exchanged easily for ultimate hygiene. Your personal comfort is assured with a range of thoughtful features to make you feel at home. The Sensia Arena includes a warm air dryer function for fast, gentle drying, and an automatic odour extraction programme that creates an airshield around the top of the bowl to keep your room smelling fresh. Plus a sensor-activated nightlight gives a soft glow to find your way at night. 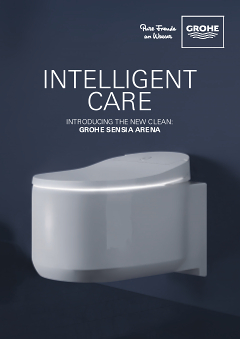 GROHE’s Hygiene Clean features combine to create the cleanest toilet in the world! Two innovative hygiene coatings work together to create an outstandingly clean ceramic. HyperClean is an exceptionally smooth and hardwearing glaze that resists 99.9% of bacteria, while the AquaCeramics coating creates an ultra-smooth surface that prevents residues and makes cleaning easy. The PlasmaCluster* technology removes bacteria, even those hiding in the farthest reaches of the bowl or ceramic surface. It does this through releasing positive and negative ions inside the toilet bowl, oxidising and eliminating bacteria for a germ-free environment. \n*PlasmaCluster and the PlasmaCluster logos are registered trademarks of Sharp Corporation. GROHE toilets have a flush that gains extra cleaning power from its unique design. Instead of one water source, the Triple Vortex Flush uses three water outlets in the bowl to create a vortex of water that cleans every inch of the bowl. Add to that the toilets’ rimless design, which means there are no hidden corners for dirt to inhabit, and this promises the most efficient flush for a clean bowl every time. It’s easy to select your preferred spray and cleaning options in a choice of simple-to-operate ways. Use the intuitive remote control to adjust your settings, or download the smartphone app to create a user profile that means your shower toilet will remember your personal preferences every time. Or just use the control panel on the seat itself. Convenience and low-maintenance are guaranteed thanks to automatic features – a sensor automatically opens the lid as you approach, and closes the seat after use and the spray heads are automatically cleaned before and after each use. 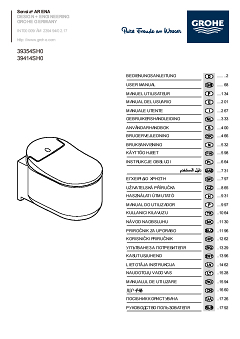 There is also the option to add sensor-controlled automatic flushing (requires GROHE Sensia Arena automatic flush connection kit 46944001 for the Rapid SL installation system 39112001). An additional opening at the back of the seat makes it easy to descale the shower toilet (requires GROHE Sensia Arena Descaling Kit 46978001).